Western Blot analysis of high mobility group protein B2 expression in Hela NE using Mouse anti Human high mobility group protein B2 (MCA4792Z). 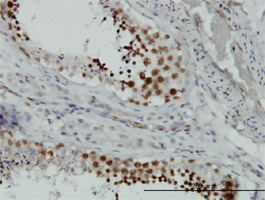 Staining of paraffin-embedded human testis with Mouse anti Human high mobility group protein B2 (MCA4792Z). 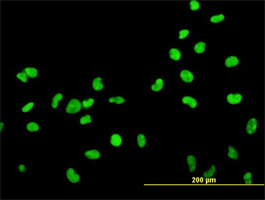 Immunofluorescence showing high mobility group protein B2 in HeLa cells using Mouse anti Human high mobility group protein B2 (MCA4792Z). Mouse anti Human High Mobility Group Protein B2 antibody, clone 3E5 recognizes human high mobility group protein B2, also known as HMGPB2 or HMG-2. Human high mobility group protein B2 is a 208 amino acid ~22 kDa multifunctional protein with roles in chromatin remodeling and posesses antimicrobial properties. Recombinant protein corresponding to aa 1-196 of human Human High Mobility Group Protein B2.